Fusion research will yield nothing if current U.S. “starve research” policy is continued. Fusion development must fail under this self justifying strategy. The National Ignition Facility (NIF) at Lawrence Livermore National Laboratory got all its parameters lined up in a row and fired away. Their target did not implode to an ignited state as they promised since 1990. Talking Heads are in motion: NIF did not produce ignition; why not stop wasting money on fantasies – why not just terminate support of the fusion energy effort? The other side of the issue bases its support on the idea that you get what you pay for. The problems and solutions are rooted in the U.S. fusion funding history to be shown in Fig 1. Update 2013 Apr 13 Commenter (bottom, this post) submitted a public petition in support of fusion energy research. This needs your support and signature. Today the denyer effort is at full throttle – stamp out what little we are doing because NIF proves controlled fusion energy devices will never work. “Everyone knows” Fusion’s eternal promise – a working fusion power generator is just 20 years away – is stupid. Joe Romm presented a slam on fusion funding recently in 2012 Oct-09 piece. 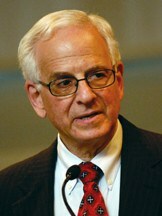 Dr. Romm is a climate change expert with many years of experience. He joined the Department of Energy in 1995 when NIF was officially awarded to LLNL. He claims to have been there from NIF’s beginning, but Beamlet, the NIF early prototype, began operation in 1992. Earnest planning for NIF was begun in 1993 after 5 or 6 years of intense lobbying the weapons research community for support. Dr. Romm is unchallengeable as a top climate change expert. As a fusion commentator … well, anyone can do that, even LastTechAge. Romm quotes the NYT article used in the LastTechAge posts on NIF. His criticism is based on the opinions of a mentor, Dr. Lawrence Lidsky, who was Associate Director of MIT’s fusion lab in the mid to late 1970s. Lidsky wrote a strong 1983 article criticizing fusion. Lidsky attitude came from his fusion experience in the 1960’s and 1970’s (see timeline discussion after Fig. 1, below). By 1980, he had moved on to became an advocate of the modular gas-cooled fission reactor design (LastTechAge also endorsed this). Actually, fusion understanding strengthened dramatically in the 1970s and entered maturity in the 1980s. Lidsky’s 1983 criticism was far out of date. Andrew Revkin of the New York Times has presented a different argument, based on a recent talk by Dr. Robert L Hirsch at a recent physics meeting. Dr. Hirsch has stunning credentials. He lead the new ERDA between 1976 and 77, and directed many energy research programs. He has worked as senior adviser at ARCO and EXXON. Also at SAIC, EPRI, and the RAND Corp. He has been deeply involved in energy issues of all types but especially with peak oil problems; he received the M. King Hubbert Award in 2009. In 2006, Hirsch wrote a paper on strategies to cope with the end of cheap oil and was warned off by the ideological operatives of the Bush/Cheney administration. This is a hard man to critique. Fig 2: Westinghouse Gen-III AP1000, approved for build. The problem is that Hirsch’s comments seem be missing the intended mark. He compares the size of a fission reactor core with the much larger toroidal size of the fusion plasma. Fission cores need high neutron flux and must be very compact while plasmas are thin gases and need room to gyrate about field lines without getting lost. The fission power reactors deployed in the US descend from the reactors used in submarines. By the mid 1950s, they were optimized for compactness, not safety. 5 decade later, the industry has produced ‘Gen-III’ proposals, highly evolved versions of the sub reactors originally built (Fig 2). Fig 3: Diagram of ITER. ITER (Fig 3) is a 3 decade delayed step along the path toward a fusion power generation station, not a commercial power producer. ITER:test bed vs AP1000:Gen-III PWR. The AP1000 is highly evolved station that still is not safe against multiple unplanned events (like an earthquake + tsunami). To make matters worse, he compares of central cores only, not the total facilities of ITER and Gen III fission reactors. He appears to view ITER as a power generating station, not as the test stand for an idea that should have been on demonstrated 15 years ago. First prototypes are built to demonstrate function, not cost effectiveness. ITER was built to be the most expensive version of the design possible. It is the focal point of multinational interests, which caused huge time delays, mechanical compromises and site modifications (each a price escalator). It suffers huge overruns in current acquisitions (see Scientific American). The international tokamak cannot look competitive from any viewpoint. Competitive, efficient … not its purpose. Dr. Hirsch must know all this. He is a superb and respected worker in energy issues, but his feel for fusion appears to be frozen in the early 1970s, just like Lawrence Lidsky. Weird. 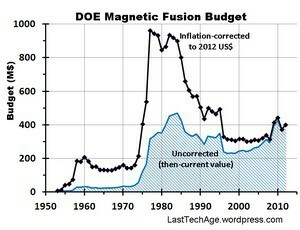 Fig 4: Fusion Budget as issued at the time (“then-current”) and inflation adjusted to 2012 values. What actually happened is that Pre-1970 optimism was based on a naive dream: since H-bombs were easy (sort of), the next machine simply had to be fully successful. Naivete ended in the late 1960s when the Russians presented their tokamak results. The 1970s showed spectacular growth in understanding due to the growth in support. All this while the US underwent 2 oil embargos, and increasing inflation (peaking in 1983). By decade’s end fusion had full presidential support; the community was alive with new developments. Exciting times, then. 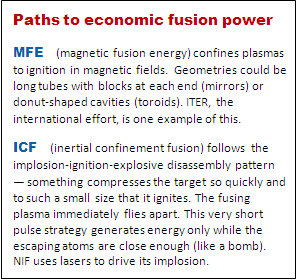 Fig 4 data are from the Fusion Power Associates. Click the graph for a larger image. By the mid-1980s, Lidsky’s view was 5+ years out of date. 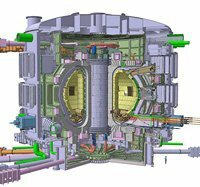 Proposals to the US government from the mid and late 1980s were very close to the ITER design the rest of the world is building today in France. Carter was the last President who fully supported developing energy independence. Pres Reagan entered office (1981) pledging to terminate the DOE, and demonstrated disdain by removing the solar panels from the White House. At General Atomics, Doublet-III was funded, built and operated before 1980, its upgrade authorized by 1984. Most of the large fusion installations were dismantled in the next decade, we have few graduate schools training new fusion energy physicists and it only 2 national facilities continue at least some level of research. Between the peak support (1977) and lowest subsequent support (2008) the fusion budget sank by nearly 4× after adjusting the budget figures to 2012 dollars. Our capability should have continued its growth. Instead, facilities have closed and layoffs of technical staff have occurred. Suppose your paycheck were cut by even 1/3 its value? How would you cope? The currently proposed 2013 budget has enough for our contribution to the ITER effort (not enough to move it forward faster) but we may be forced to close down a world-unique facility at MIT. Development results are under the positive control of enabling budgets. Prior to the early 1980s, increasing budgets correlated to skyrocketing advances in fusion understanding. Currently, the coming severe cuts in funding threaten its survival. The political action in these last decades have led to current self-fulfilled response. 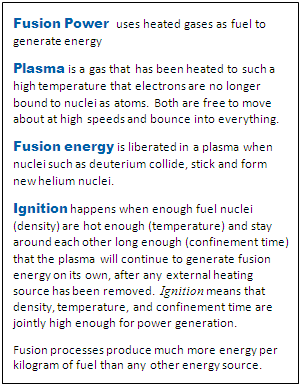 The US fusion science has spun its wheels for the last 2 generations. Some valid progress was made, but without tests of new ideas, break-away change is not possible. Did NIF prove that fusion energy is not possible? No. Fig 1 shows Lidsky’s 1982 statement was (the beginning of?) the policy of self fulfilling prophecy. Update: 2012 Nov 20 Andy Revkin, in his 2012 -Nov 19 contribution to the New York Times DotEarth blog, re-posted a response by Stewart Prager (Director of PPPL, Princeton Universities DOE fusion laboratory). Dr. Prager actually responded to two denyer posts, not just Hirsh’s efforts that LastTechAge dissected here. Dr. Prager brings high technical credibility to the discussion; we have referred to his empassioned discussion here.